From crispy fried appetizers to hearty stews, this versatile vegetable stars in many of the South’s signature recipes. If you have been lucky enough to dine at a true Southern restaurant, it’s likely that you have encountered breaded disks of sliced green okra. 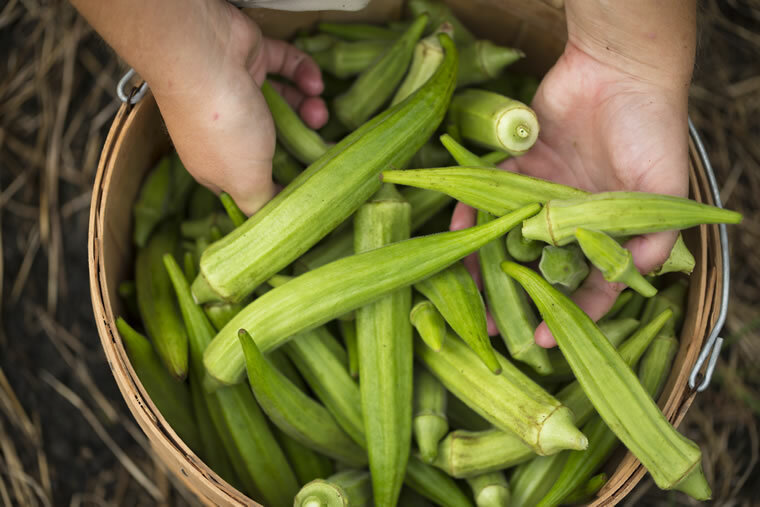 Enjoying this fried Southern staple is a prerequisite to truly understanding the region’s cuisine, as okra permeates many of the traditional dishes. Fried, stewed, pickled, roasted or simply eaten raw, the ingredient is as intertwined in favorite local recipes as black-eyed peas or pecans. 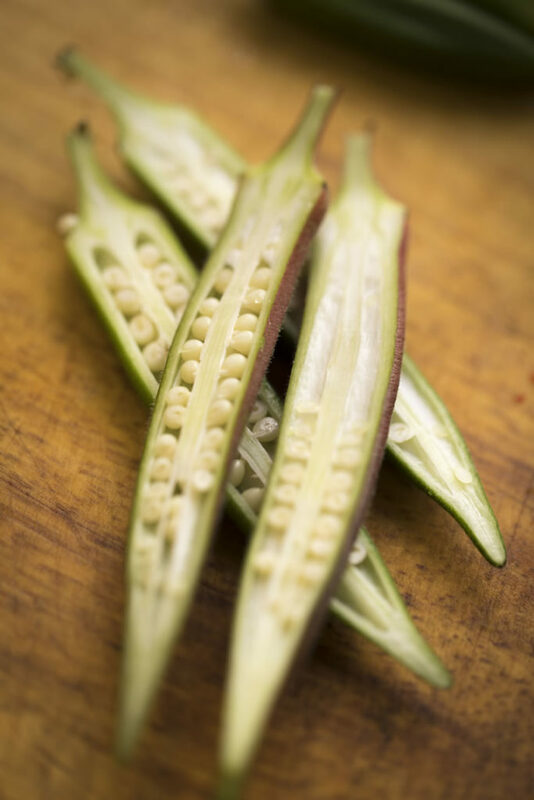 Okra’s long history in the South is thanks in part to the ease of growing the vegetable, which made the crop a popular choice for production. It grows in a multitude of soil types and yields beautiful hibiscus-like flowers that stay open during the day and close at night. Okra thrives in warm climates, and is harvested well into October throughout most of the Southern states. However, for those who aren’t fond of the sticky element, it can be minimized by the type of cooking method. Adding an acid to a dish helps reduce it, while searing or frying stop the liquid output. One thing is certain, okra’s versatile nature provides plenty of options when it comes to preparation. Delissio serves okra with a little bit of a twist: pickled, then fried. 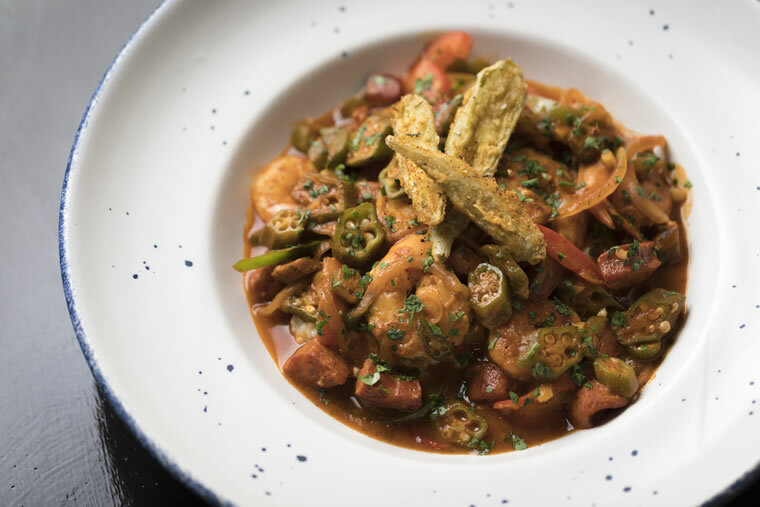 “It’s a cool contrast—frying anything that is pickled—because you get the tartness with the salty, savory flavor of frying an item.” This method is an integral part of his recipe for Southern shrimp and grits, a medley of shrimp, sausage, stewed fresh okra, tomatoes, garlic, peppers and spices over creamy cheese grits. Okra is a featured ingredient in this recipe from Christopher Delissio, chef de cuisine at Southern Tide. Season shrimp with blackening spice. In a large pan, sear the shrimp with half of the butter. Add onions, peppers, fresh okra, sausage and garlic. Sauté briefly, then deglaze the pan with the white wine. Add the tomato broth and tomato juice and gently simmer to reduce and thicken, seasoning to taste. While the sauce with the shrimp in it is reducing, dredge the pickled okra in seasoned flour and deep fry until golden brown and crispy. Just before plating, stir the remaining half of the butter into your shrimp and sauce. In the middle of a large bowl, place half of your hot grits. Top the grits with half of the shrimp and sauce. Garnish with half of the fried okra. Repeat for the second portion and serve immediately.